Hello poor lost souls looking to sell a FZ10. 1st my condolences. 2nd sell me your bike. It's spring so southern states or local to near Chicago preferred. Mid-summer Im nationwide fly and buy mode. Meet me 1/2 way or bring it to me and sleep over. Flexible is my middle name. I can buy near to Chicago or fly to whatever stunning locale/urban cesspool your bike is at. The sooner I book airfare the cheaper. Why not go buy a new one for 11,499 at dupage Yamaha in Chicago. Taxes etc. 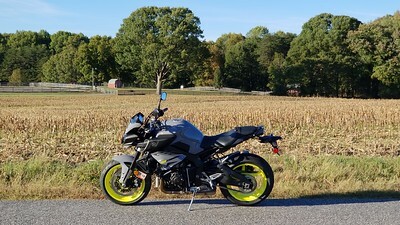 On the FZ09 forum so many low mileage fully modded bikes were posted I almost kicked myself. That bike needed major suspension upgrade and a flash. This bike not so much. Flash almost certainly. So yeah, when you add in airfare etc, I might as well buy new. Wrong time of year. Ill start pestering them now and see them again in October. If anyone needs to bail sooner lemme know. 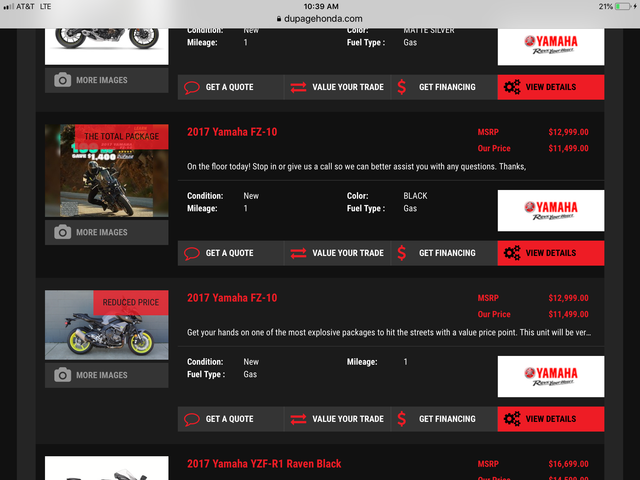 $11,499 was the price for a 2017 at Rich's Yamaha. $11,999 for 2018. Go figure. Freaking games puts one off. 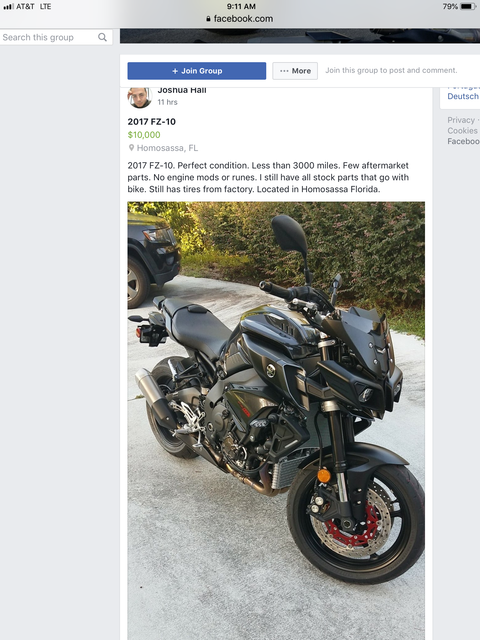 There’s one for sale on Yamaha fz-10 riders Facebook page for $10,000 with less than 3000 miles in Florida. Did you ever find one? I sent you a PM with no reply. He hasn't posted since April 17th, I think he is gone with the wind.